After Swiss and Danish parcels, this one came from closer to home….the Barbican in London to be precise. Funnily enough I had been there to see Ben Folds’ Piano Concerto just days before Sally, my provider of all things delicious for this month, contacted me. 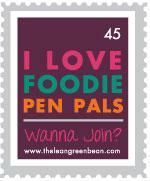 Well, we may not have won the World Cup, we may flop at Wimbledon and crumple in the cricket (most of the time), but I can proudly say that when it comes to the foodie penpal prize, we’re up there with the best of them (Brits / English, UK-ers, Londoners, whichever you will). After the delicious chocolatey excesses of Switzerland I was excited to see a predominantly healthy parcel with a few treats. 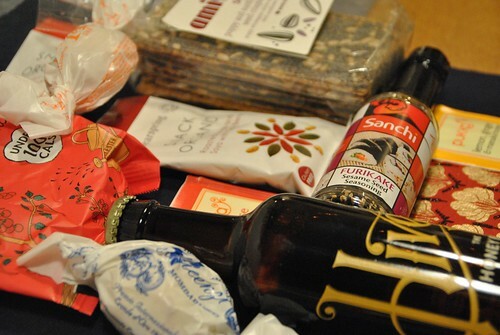 Not only was the contents great tasting but when I laid it out, it was all colour coordinated – even the notecard. Sally, I have no idea whether this was on purpose but respect either way! Furikake: Sesame seed and seaweed seasoning. Great on salads and for sprinkling over vegetables before roasting. Giant Amaretti type biscuits: but not the hard rubbish ones from coffee shops. These are GOOD. Carluccios? Clearspring snacks – Soybean, Goji Berry and Pumkin seed mix & Tamari Roasted Almonds. These are exactly the kind of things I crave. The clearpsring range is one I have seen a lot about on blogs so I was glad to get to try it. Again, really impressed with these. 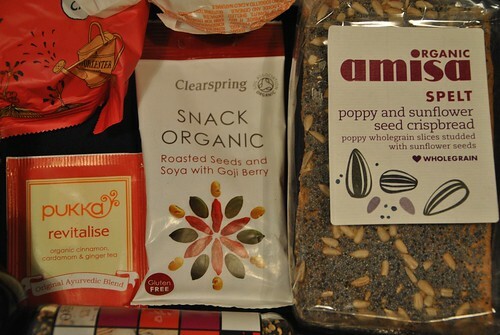 Amisa Spelt Crispbread – My first foodie penpal repeat and I’m very happy for it to be so. I got this in my first ever parcel and loved it so I was delighted to have it again. Great for dunking in boiled eggs or having with a salad or for snacking. Pukka Herbal teas – healthy hot drinks. Oh no! That’s such a shame. You should tell Sally(?) the organiser. She;s very good at chasing these things up. Why was it so bad?